TEMECULA, Calif., Dec. 6 2018 /PRNewswire/ -- S2A Modular is shattering the world's conventional thought on the way residential and commercial buildings are designed and constructed. Launching the new brand globally with the introduction of the #GreenLuxHome, as well as ushering in a new era in how world-class hotels and other business structures are built, S2A is redefining the phrase "sustainable living." THE FUTURE IS HERE. Introducing the #GreenLuxHome. 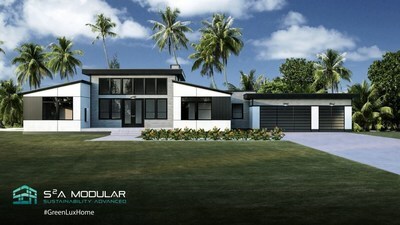 The first electrically self-sustaining, custom luxury homes are creating a new standard with high-end design and materials; faster construction speed; "surplus energy income" (Net Zero) generated from Tesla Powerwall technology and solar panels; tailor-made premium features; and smart-connected living. DREAM BETTER: S2A Modular allows home buyers to dream up a bigger, better lifestyle – either choosing from more than 35 pre-designed, high-end floorplans or literally creating a living space that was never thought possible before. In less than six short weeks after choosing designs and receiving approved plans, homes are built in their entirety with a visually identical foundation to a "traditional structure." BUILD BETTER: Instead of onsite development, S2A builds the home in a controlled environment, custom to home buyer specifications, with the latest in state-of-the-art appliances, smartphone-controlled settings and more pre-installed. BETTER LONG-TERM HOME VALUE, IMMEDIATELY: #GreenLuxHome units instantly carry more long-term value than a traditional site-built home. A NEW ERA IN WORLD-CLASS COMMERCIAL BUILDINGS FOR TODAY AND TOMORROW. BETTER EFFICIENCY: S2A provides turnkey solutions that allow corporations big and small to develop their projects quickly. This new wave in commercial building construction eradicates cost-efficiency challenges associated with traditional brick and mortar construction, removing the need for multiple partners, vendors and longer timelines (which add cost). S2A Modular keeps it all under one roof in its 100,000-plus square foot MegaFactory. No more gas, no more propane and no more reliance on grid-powered energy. To achieve this, sleek solar panels hug the roof top of either a custom home or commercial facility. Pulling from the solar panels, Tesla Powerwall units deliver complete, lasting energy to the house or building. Available when needed – even when the power grid is down. S2A MODULAR MEGAFACTORY: SHIFTING THE PARADIGM WITH BETTER QUALITY AND BETTER EFFICIENCY. "A Green Lux Home isn't just a slogan: we're smashing old-fashioned perceptions and truly are creating a new category of custom homes that simply aren't comparable to any traditional site-built, modular or other types of residences. An S2A home is immediately superior in long-term value, upon appraisal, to a traditional home – and for good reason. Simply put, a Green Lux Home saves money, time and energy, while reflecting the ultimate level of sustainability, luxurious design, high-end materials, smart-connected features and an overall better way of living. We're creating a home revolution!" "When I reveal to people that world-class hotels from globe-leading chains, such as Marriott, are being built 'modular,' there's a real sense of shock because the finished product is visibly identical to any other hotel. S2A is at the forefront of that movement, constructing commercial buildings and full communities in a more controlled environment within our new, one-of-a-kind MegaFactory facility. Cost-efficiency challenges associated with traditional construction are eliminated immediately – dramatically cutting down build times, complexity and overall expenses, while offering better quality, customization and real sustainability. We're changing the game, plain and simple." For more information or to schedule interviews with S2A executives, contact s2amodular@godriven360.com.